HAPS is pleased to announce the solo exhibition by Michael Whittle(HAPS studio artist) “Portraits of Thought: Diagrams in Art and Science” in The Kyoto University Museum. Opening times:Every Wednesday – Sunday, 9:30-16:30 (last entry at 16:00), except national holidays. Diagrams are a powerful and ancient tool that helped shape human thought from the Stone Age to the Information Era. We now know that the first cave paintings are five times older than the earliest writing, and over time, diagrams have evolved to become not only the creative engines of the scientific revolution, but the visual language of science itself. Artists have incorporated diagrams to their creative practices and have given rise to some of the most important and challenging works of art, from the notebooks of Leonardo da Vinci to Marcel Duchamp’s ‘Large Glass’, Arakawa and Gins ‘Mechanism of Meaning’ series, and the wall drawings of Sol Lewitt. From the Renaissance tree of all human knowledge to the discovery of the God particle and echoes of the ‘big bang’, these images capture our innate drive to understand reality through the power of the diagram. Presented alongside these are a series of intricate, new diagrammatic drawings and paintings that combine contemporary art and science. Several of these works were created by Whittle after spending time at laboratories in Kyoto University’s iCeMS (Institute for Integrated Cell-Material Sciences), where he spoke with scientists about their latest research and discoveries as part of a quest to develop what he calls a romantic-objective ‘poetics of science’. Michael Whittle qualified and trained as a Medical research biochemist before changing subjects to study fine art. During his MA at the Royal College of Art, he won a scholarship to study at Kyoto City University of Arts, Japan’s oldest art school. He was later awarded a prestigious Monbusho scholarship to return to Japan, where he wrote his award winning PhD thesis ‘Romantic Objectivism: diagrammatic thought in contemporary art’. The thesis proposed an entirely new field of diagrammatic fine art and helped establish deep philosophical, semiotic and aesthetic links between art and science. It was recently selected by MIT Press’ Leonardo Magazine for it’s top 10 list of research in art and science, 2018. 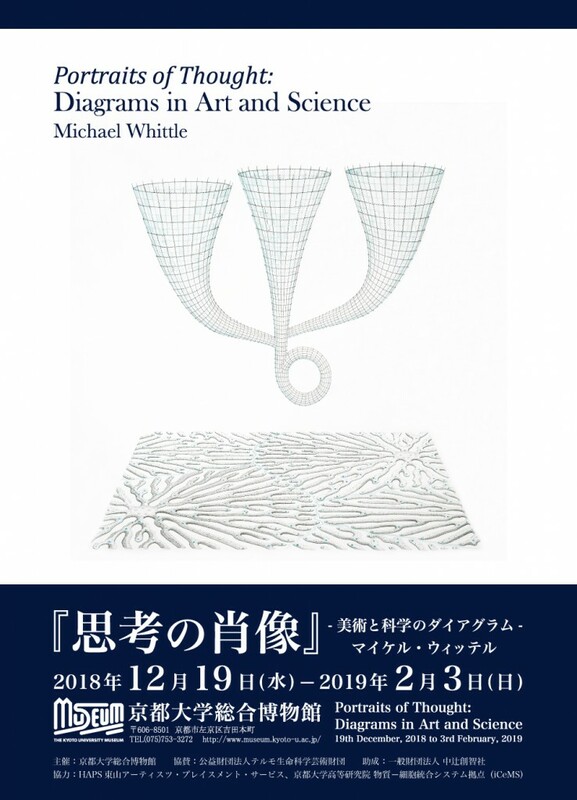 Whittle currently lives and works in Kyoto and exhibits and lectures internationally.